Glitzy is one of our bred, born and trained at Eromit superstars. She is from the second Beretta x Chester litter- we trained two puppies from the first litter and they were so biddable, intelligent, drivey and well built that we just had to repeat the breeding to keep a puppy for ourselves. 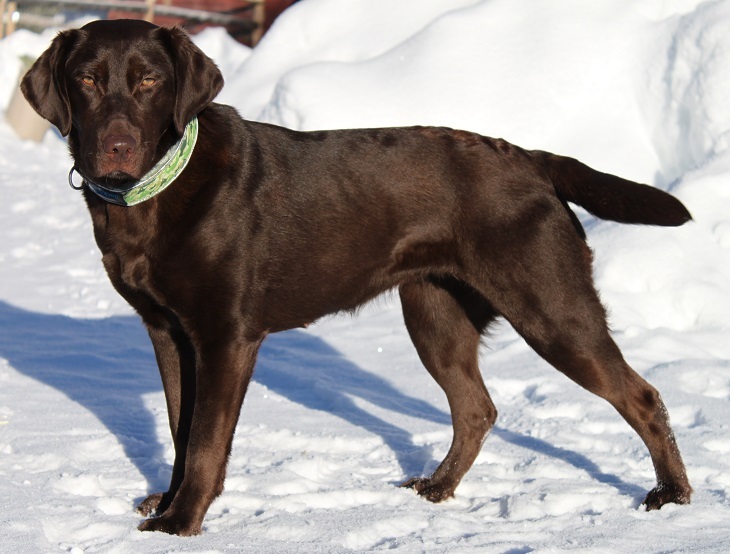 Glitzy has grown up to be everything we hoped of an more- she is the 4th generation of agility titled Labs that we’ve trained, earning her SGDC title in only a few weekends of competition. 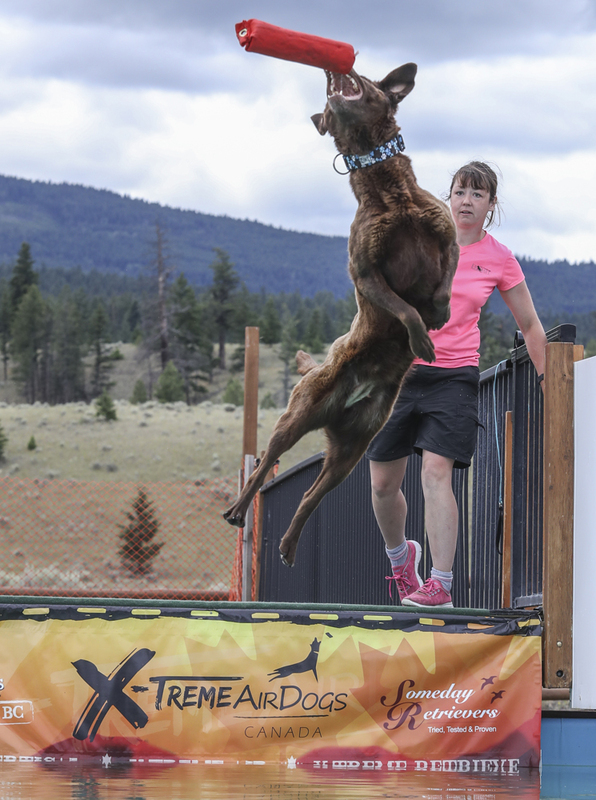 She earned highest honors in novice rally obedience, and was instantly successful at dock diving, where she won the Xtreme Vertical BC semi-pro championship only a few minutes after having her first try at this event. Since then, she’s improved her personal best in the high-jump event to 6’6″ and 21″ in Xtreme Air and an impressive 15.401 in Xtreme Retrieve. In addition, Glitzy is also the 2014 Eromit Cup agility winner and the 2015 Eromit Dock Derby winner! There are many great features to this smart girl. Glitzy boasts an extreme drive to retrieve, and an equally great desire to please. She is very fast and focused at any task she takes on and has an exceptional balance of independence and ability to take direction. There is no such thing as a physical barrier if it’s between her and her goal- Glitzy will not hesitate to swim in any type of water (even the frozen type), no thicket is too prickly, no obstacle can prevent her from going under, over or through, and her very correct physique & body awareness sets no limitations. She is a very eager and tireless worker, but a personable, submissive dog with people and one of the easiest dogs to train and live with. 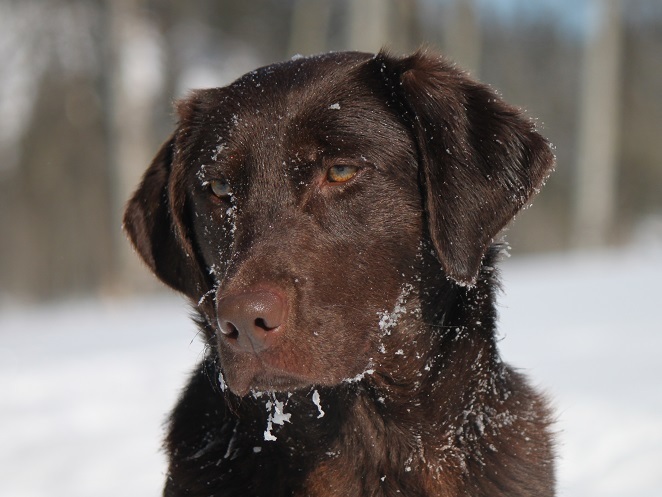 Her persistence and determination could be a challenge for a first time Lab owner but it is exactly the kind of attitude we want in a performance or working dog. Her enormous drive and energy are tempered by a great off switch and affectionate attitude. Our first Glitzy litter was born in early 2015, sired by Ozzy. The puppies showed such great promise in following in their successful ancestors footsteps that we decided to co-own a female puppy with the Frasers in Prince George. We hope that “Blaze” will be able to contribute to future generations of talented performers and she has already proven herself in dock diving, having won the BC Amateur championship in 2016. Other littermates are titled in rally and agility already and have shown talent as hunting dogs and in lure coursing! Glitzy’s 2nd litter was sired by Ruger in 2015 and puppies are already excelling in training for agility, obedience, and dock diving – at less than a year of age, “Vino” became the 2016 Canadian Amateur dock diving champion and “Calibre” won the 2016 Yukon Dog Puller sports puppy division championship! Glitzy’s last litter was born in early 2017 – an all chocolate litter sired by Harvey. Puppies are still young but reports are favorable for the puppies who were placed in homes where they are being trained as pets, hunting/hunt test dogs and a search and rescue hopeful.